Caption: "Passing under Grand Central Parkway". Suggested Revised Caption: Passing under the Grand Central Parkway in Queens. 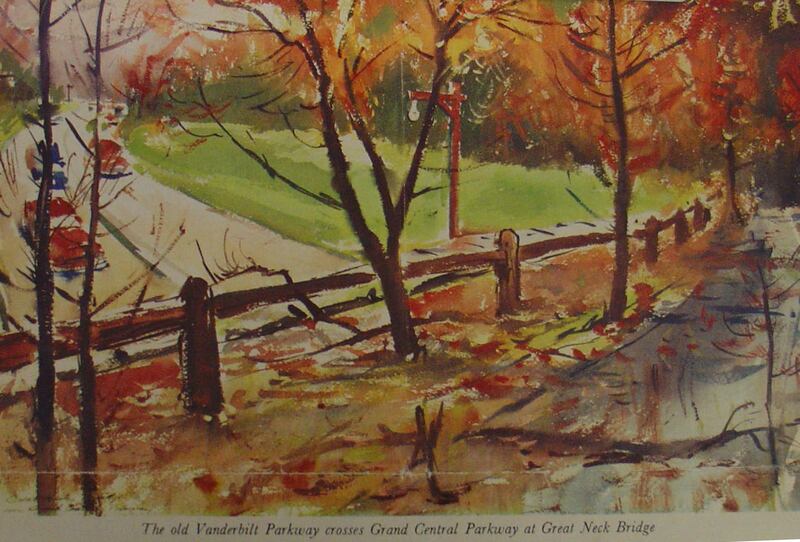 Caption: The old Vanderbilt Parkway crosses Grand Central Parkway at Great Neck Bridge." Suggested Revised Caption: The Long Island Motor Parkway crosses Grand Central Parkway in Lake Success. Caption: "Great Neck Lodge on the old Parkway." Suggested Revised Caption: Great Neck Lodge on the Motor Parkway in Lake Success. Caption: "Through backyards north of Hempstead." Suggested Revised Caption: Through backyards in Manhasset Hills east of New Hyde Park Road. Caption: "The Vanderbilt Parkway sometime bridges modern highways, and sometimes, as in the scene near Mineola, passing underneath." Suggested Revised Caption: The Long Island Motor Parkway passing underneath the Ruland Road Bridge in Melville. 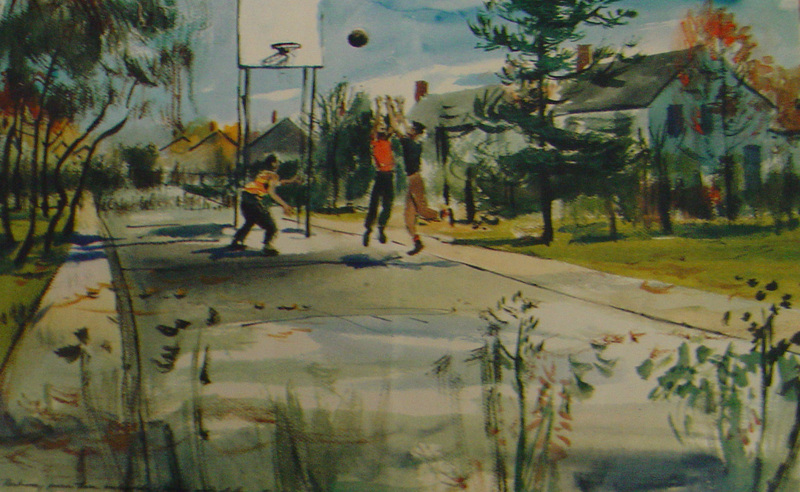 Does anyone know what ever happened to Kahn's original Motor Parkway paintings? Click here for a pdf of the 1955 article "The Granddaddy of Superhighways". Interesting paintings by Harvey Kidder. In one of them I see lampposts on an upper roadway. I’m assuming the LIMP there is running the underpass (perhaps Old Courthouse Rd) since I believe the LIMP had no lighting. Is there any info on lighting of the LIMP? How did they power the toll booths on the ROW? I’ve never noticed lamposts in any of the LIMP accident photos at night. Those night pics give the impression of dark, nightmarish times but in daytime, I’m sure it was wide open paradise! 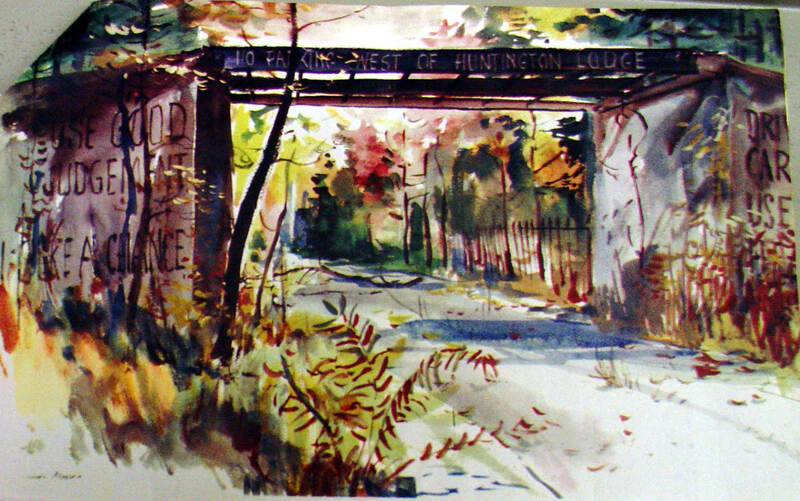 The painting depicts the old motor parkway crossing over the Northern state parkway just about 1000 ft. west of New Hyde Park road, before the Northern state was widened in the 1950s. 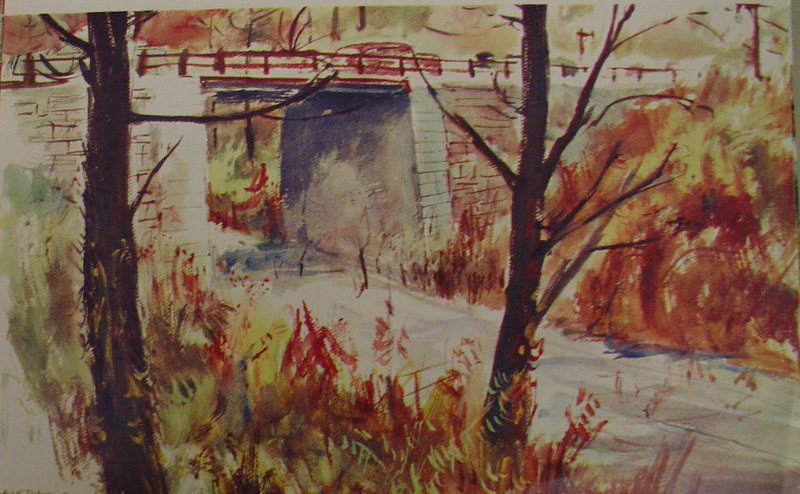 I had many bag lunches on my bicycle wanderings as a young boy on that bridge. That bridge was built by the state when it was building Northern state pkwy. The eastbound exit ramp of the Northern Pkwy. marks the spot today. 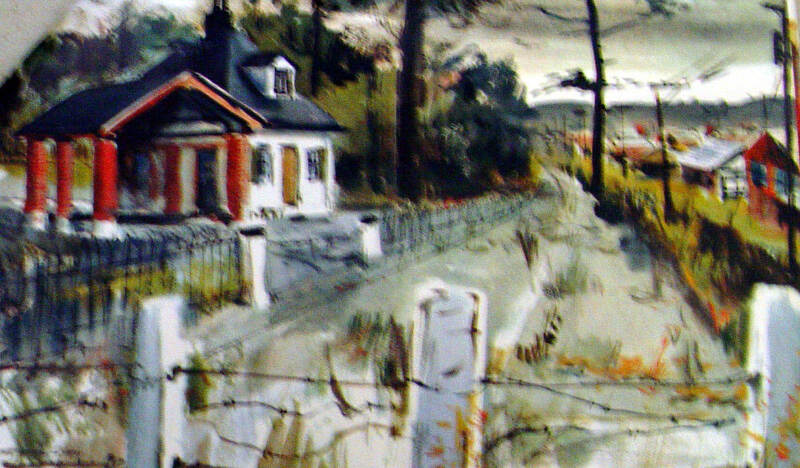 The painting of the Great Neck lodge depicts the Lakeville Road bridge on the Nassau/Queens border which was closed (as it is in the painting) The building was a private residence in the 50s…gone…or not recognizable any more with many homes now there.. I also had lunches there as well as a long, banked curve about a mile or so to the west…where Glen Oaks apartments was built in the mid-50s. As far as lighting on the motor parkway…as far as I know..it did not have any. Lodges probably got power from the cross streets. That was a grand old road! I rode my bicycle from the start in Flushing, to what is now route 110 in Huntington, as well as the closed sections going east of that in later years…and drove to Ronkonkoma many many times in the 40s and 50s. My mother rode with her uncle on the parkway the last day it was open.